The term “tsunami” is originated from the Japanese word harbor (“tsu”) and wave (“nami”) meaning “harbour wave”. Tsunami also known as ‘seismic wave’ is a group or series of waves that deliver surges of water at great heights at times reaching more than 100ft over to the land. 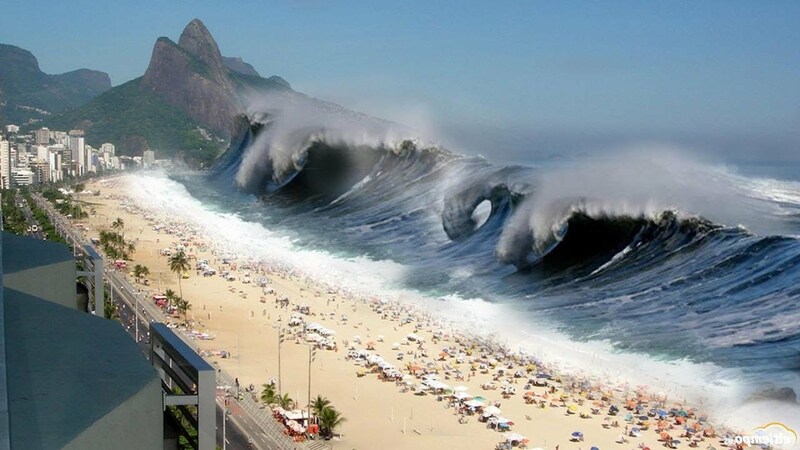 The tsunami is different from normal ocean waves, which are generated by wind, or tides, generated by the gravitational pull of the Moon and the Sun, whereas tsunami is generated by the displacement of water. When one plate subducts under another plate, after a period as a result the mega thrust is given away. As this part is given away, it breaks the ocean bed, resulting in bringing a massive displacement of the water. This causes the water flows as a series of very high waves, which increases near the land or shore called Tsunami. Most tsunamis occur due to earthquakes which occurs in subduction zone, the area where the plates of the ocean are being enforced into the layer by plate tectonic forces. Tsunamis can also be caused by events such as underwater volcanic eruptions, underwater landslides, land slumping into the ocean, meteorite impacts on the sea etc. It is to be noted that all undersea earthquake does not cause tsunami, the earthquake must cause significant vertical deformation of the seafloor to cause tsunami. Tsunamis are usually occurring from shallower and larger earthquakes than deeper or smaller ones. To know the implications of Tsunami, lets analyze Tsunami occurred in Japan on 11th March 2011. A mighty tsunami which travelled 800km per hour with waves 40m high and caused by an earthquake of magnitude of 9.0 not only brought tremendous damage to the land but also killed approximately more than 18000 people. The estimated cost of damage is about 300 billion USD, apart from the after effect like, disease, infection, non-availability of drinking water, non-availability of electricity, damaged road and non-functional electronic communication, damaged buildings etc. The most significant tsunami caused nuclear accidents was the Fukushima Daiichi Nuclear Power Plant accident. In case of tsunami, the destruction is caused by two mechanisms: the smashing force of a wall of water traveling at high speed, and the destructive power of a large volume of water, returns back from the land and carrying all with it, even if the wave did not look large. This natural disaster not only results in tremendous amount of destruction, loss in people, animal life, but also brings various new diseases, permanent landscape changes. Tsunamis also causes environmental destruction by uprooting plants, invasion of the salty water affecting the salt tolerant-plants, it also affects the fertility of agricultural lands, contamination of the water bodies. The result of Tsunami also affects the smaller and larger animals. Mostly after tsunamis animals are found hungry, injured, homeless and sick. Tsunami not only affects the animals and other organisms on land but also brings changes to the animals living in the water body itself. After the tsunami washes off, many chemicals enter the water body and affect it by not only polluting it but also by bringing new diseases to the water body. From the above it is clear that Tsunami affects all works of life including social, geographical, psychological, environmental, economical life in the affected area for all living creatures. It is now clear that the natural disaster like tsunami cannot be prevented but can be predicted to minimizes the loss to life and property. A system known as the warning system supported by the National Oceanic and Atmospheric Association and Other similar agencies have set up an effectual warning system and educational programs to spread awareness to inform people about the forth coming incident of tsunamis far enough beforehand. Typically, a network of seismic monitoring stations are used to detect earth quacks that may generate a tsunami. The seismic monitoring stations based on the real time data relayed through satellite communications, can determine the location and depth of earthquakes that have the potential to cause tsunamis. That can be verified by sea-level monitoring stations and deep ocean tsunami detection buoys with bottom pressure sensors, which constantly monitors the pressure of the overlying water column to detect abnormal changes in sea level to verify if a tsunami has been generated. Through Computer models, within minutes the estimates of tsunami amplitudes, flow velocities and arrival times for offshore, coastal and inundation areas can be predicted. Education or awareness is another key element of the warning system as the time for action is very limited. Hence the venerable areas are to be identified and awareness about the marked evacuation routes to assist residents and visitors to higher ground to be practiced apart from distribution of tsunami education information, conduct community meetings and workshops, and many more awareness activities. Detection or perdition of tsunami is only half the battle. Once the Tsunami is confirmed through the warning system, it must be effectively and rapidly communicated to the affected areas, through SMS, news outlets, television and radio broadcasts, weather radios, activation of community outdoor siren systems, for people and authorities to take immediate evacuation action. Tsunami cause significant damages to the farms, factories, roads, railways and electricity lines, communication, people have been made homeless etc. But after the Tsunami, everybody will come together to rebuilt in a new, organized way, taking cue from the lesson learnt. Tsunami gives opportunity for redevelopment by destroying the illegal and/or unsafe buildings, leaving room for reconstruction under better standards. It takes away the debris from the coast line and the sea beaches. Recycling and disposal of the waste generated by tsunami, in an environmentally sensitive manner like crushing concrete, bricks, etc. to generate aggregate for rebuilding and road reconstruction, are critical. Last but not the least the reconstruction boosts the economy. Author Bio : Hrishita Patnaik , Class 6-I, DPS Sharjah, Age : 12 Years ,City : Sharjah, UAE, Email : rupakant@yahoo.co.in. A Winner (Below 18 Years) of International Essay Competition ,Month of December 2018 .She Won $20 Gift Coupon, A Trophy and e-Certificates from #Monomousumi.